2019 is the year of trying new things! For a picky eater like myself, nothing terrifies me more than trying new foods. I really like playing it safe. Failure feels awful to me, and stepping outside my comfort zone makes me super uneasy. I’ve made a promise to myself that I would say “yes” more than “no” this year. This week, I attempted my first French pastry. I didn't expect an extravagant result because I realize that people go to school for years to master the art of pastries. However, I have to say, I’m incredibly pleased with my results! This week I asked my parents what they would like to see next. My mom isn’t a huge fan of sweets but my dad asked for a simple cream puff. I began my research because common knowledge is that pastries are NOT as simple as a cake. 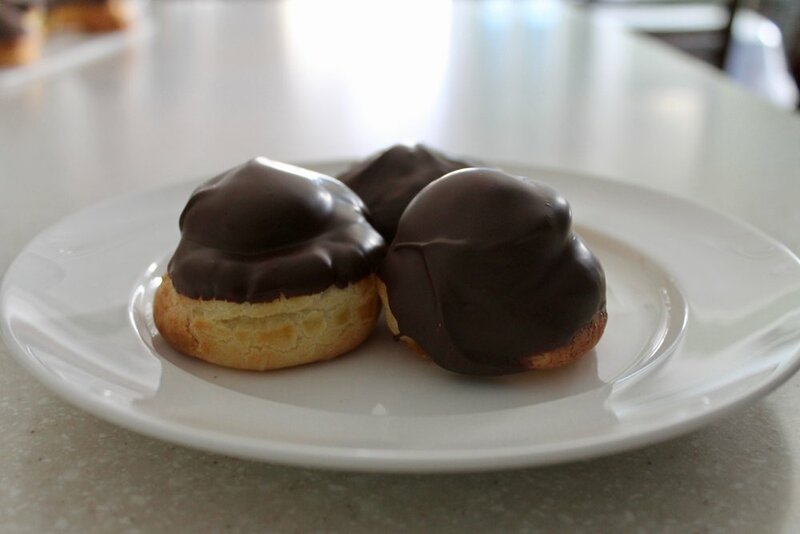 I discovered that a cream puff, more formally known as a profiterole, is a small pastry made of pâte à choux, filled with a custard, cream or jam, and they’re actually not as complicated as they seem. The first step for me was to learn how to make the choux pastry, and I headed over to my favourite YouTuber for some advice. Gordon Ramsay is a British chef and owns some of the most incredible restaurants. Over the years, his restaurants have been awarded 16 Michelin stars, which signify absolute excellence in the food industry. The version of Gordon Ramsay that American television shows us is incredibly different from the real Gordon Ramsay. This man seriously knows his food and he is an absolute artist. I could spend hours watching him cook. His YouTube videos are packed with tips and tricks, and I take a lot of flavour inspiration from him. His tutorial for profiteroles was where I began. I adapted his recipe a little to create a recipe of my own, complete with traditional pastry cream. I was enrolled in French Immersion in grade school, which permitted me to visit some French-speaking provinces and countries. My first experience was in 2008 when my class took a trip to Ste. Pierre et Miquelon. My teachers were so excited to bring us to a patisserie, which sold hundreds of different pastries. For most of us, we had never tried an authentic French pastry before. Now that I’ve learned some of the basics of pastry-making, I can’t wait to try and replicate some of my favourite pastries like mille-feuilles, croissants, and pain au chocolat. I’d love to share these with you as I discover some new recipes, so stay tuned for more pastry-making in the future! 2. First, prepare the choux pastry. In a saucepan over medium heat, melt butter. Add in water, milk, sugar and salt, and whisk until simmering. 3. Remove from heat and dump in flour all at once. Stir until a ball of dough has formed. 4. Reduce heat to low and place the saucepan back onto the heat. Mash the ball of dough to ensure that there are no clumps of flour remaining. 5. Transfer dough to a mixing bowl to cool for several minutes. 6. Beat 4 eggs together. With the mixer on low speed, slowly add the eggs in several additions. Continue to let the mixer run until a glossy dough has formed. 7. Pipe the dough into mounds using a round piping tip. If a peak forms, wet your finger and press down the tips to ensure the pastry does not burn. 8. Bake at 375F for 20 minutes. Ensure that you do not open the oven while the profiteroles are baking! 9. To prepare the pastry cream, heat the milk in a saucepan. Do not allow the milk to boil. 10. In a small bowl, whisk together the flour, sugar, and salt. 11. Add the egg yolks and whisk until completely combined. 12. Whisk in a small amount of milk, then alternate between milk and whisking. 13. Add the cream mixture back into the saucepan and continuously whisk until mixture begins to boil. Once bubbles hit the surface, continue to whisk for another 30 seconds, then remove from heat. Stir in vanilla extract. 14. Push the thickened cream through a strainer into a small bowl to remove any bits of cooked egg. Press plastic wrap onto the surface of the cream, then refrigerate overnight. 15. Cut a small opening into the bottom of the profiteroles with a paring knife. Pipe the cooled pastry cream into the profiterole. 16. Garnish with melted chocolate or powdered sugar. Refrigerate pastries until serving.